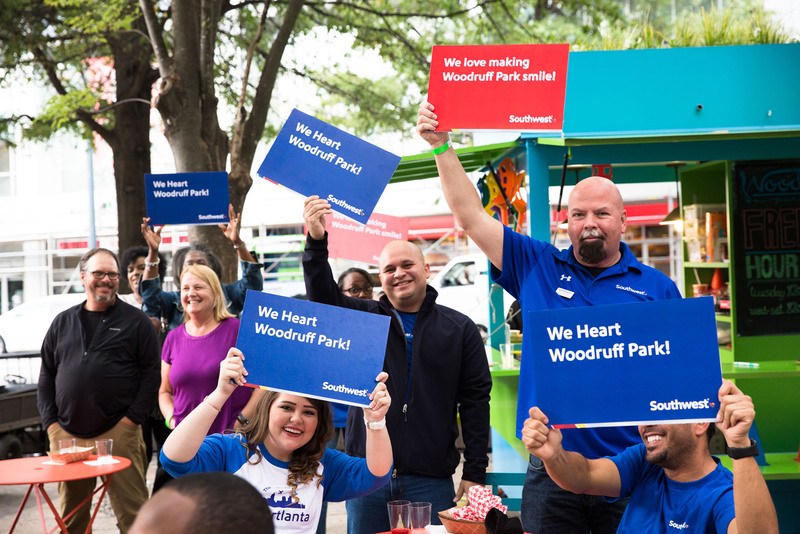 Photo by Erin Sintos, Central Atlanta Progress, Inc.
Atlanta’s Woodruff Park is becoming a place where people meet friends, tourists and visitors, regulars and locals, a place where one feels at the heart of the community. 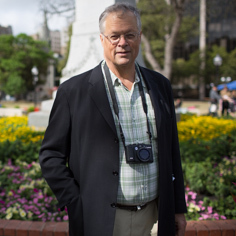 And as many other great public spaces, it is a developing hub of activity, where one is surrounded by people, engaging activities, and vibrancy. 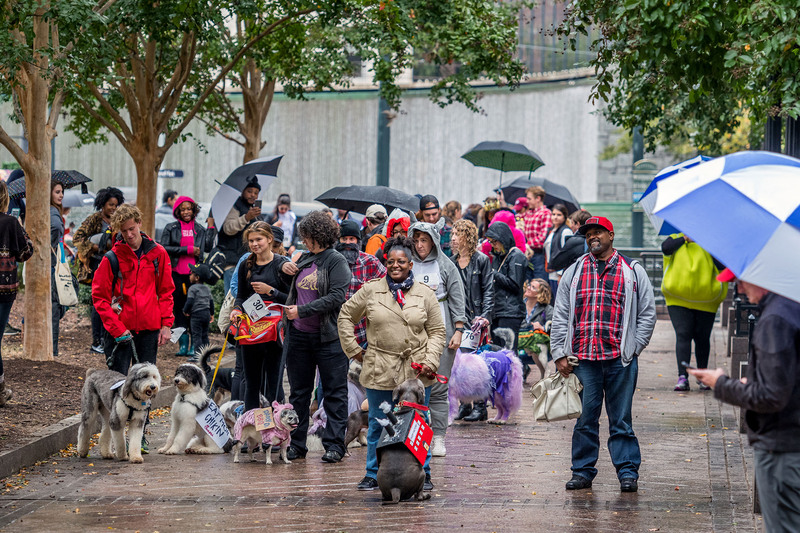 From "WoodRUFF Bark”, where people from all over the city gather with costumed canines, Caroling in the Park with music from Atlanta Homeward Choir and the Georgia State University Choral Union to Pop-up repair events and meditation, Woodruff Park continues to develop partnerships and attract more people. 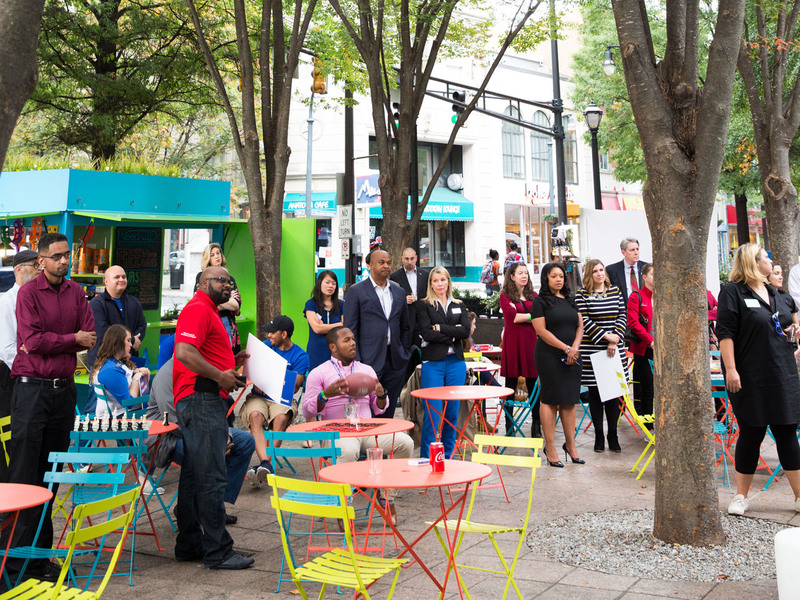 Last Spring, Central Atlanta Progress and Project for Publics Spaces engaged local residents, office workers, business owners, students and major stakeholders to collect ideas on how to improve the park. 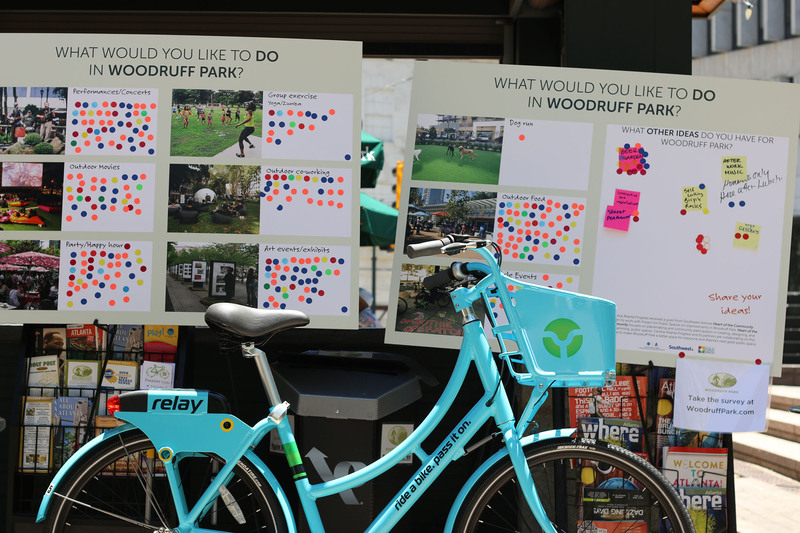 It became clear that this outreach started at the right time as many positive changes continue to happen around Woodruff park–the new bike sharing system kicked-off and more businesses are opening in recently renovated office buildings around the park.The HOTC project motivated CAP to hire a new Woodruff Park manager who is now playing a pivotal role in park activation, manag­ing activities, offering a friendly and welcom­ing presence, and acting as the key point of contact for community members with new ideas for the park. 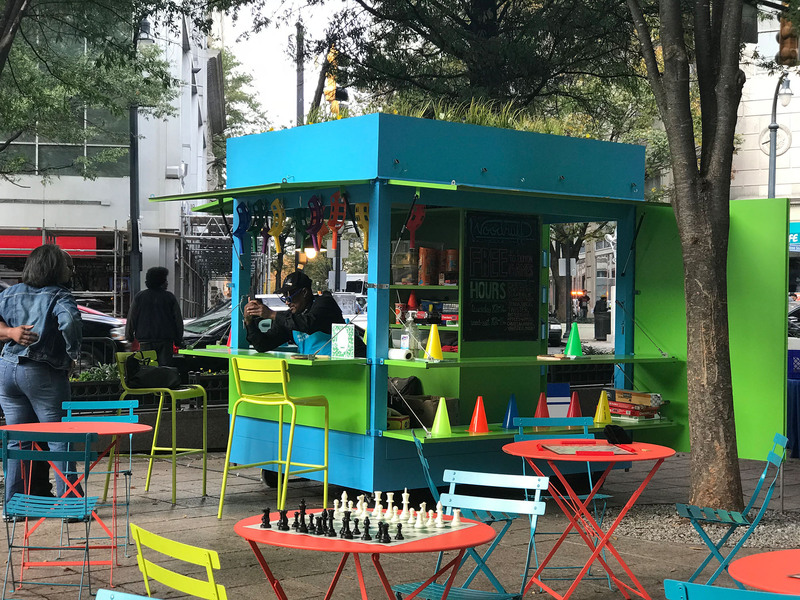 The Placemaking process focused on creating a mobile cart, custom-designed by PPS. The cart, which holds games, information, power outlets, and other amenities, is a moveable focal point for new, dynamic uses in the park. In addition to attracting a variety of users, old and new, and encouraging them to engage in the park, the cart has provided employment opportunities to members of the community. This summer it was staffed through a government-subsidized summer employment program for disadvantaged youth. The program allowed dynamic young people to connect with the park and with the people using it, to learn and engage with the place, while also getting work experience and being paid for their time. In the fall, cart staff came from an employment agency supporting people re-entering the workforce. On average, more than 40 people use the cart ever day! Photo courtesy of Central Atlanta Progress, Inc.